Philippines (Update as of May 3, 2017) – The 'November 2016 Philippine Bar Exam results' together with the list of passers, top ten (10) lawyers and related announcements are available at this website as the Supreme Court of the Philippines (SC) officially released the results on May 3, 2017 (Wednesday). As announced, a total of three thousand seven hundred forty seven (3,747) lawyers passed the 2016 Bar exams out of six thousand three hundred forty four (6,344) examinees, or an overall passing rate of 59.06%, the highest in 16 years. 3747. ZUÑIGA-GOLO, Eden Louise P. The oath-taking of the new lawyers candidates will be held on May 22, 3 PM, Mall of Asia Arena. The registration will start at 11:00 AM. The 2016 Bar Exams are administered by the Supreme Court (SC) headed by the 2016 Bar Chairman, Presbitero J. Velasco Jr., Associate Justice and Office of the Bar Confidant headed by Deputy Clerk and Bar Confidant Atty. Ma. Cristina B. Layusa on November 6, 13, 20, and 27, 2016 at University of Santo Tomas (UST). As per SC, the bar exams are given in the course of one month, spread over four (4) Sundays and are the only professional licensure examinations which require the examinees to answer open-ended questions in long hand. The 2016 Bar Examinations are the 115th professional licensure exams held by the Supreme Court of the Philippines. Bar exams are held once a year under the supervision of the Supreme Court of the Philippines. SC also designates the incumbent Justice to chair a committee of eight (8) examiners for each subject. The Bar Exams covered the following topics: Political Law and Public International Law; Labor and Social Legislation; Civil Law; Taxation; Mercantile Law; Criminal Law; Remedial Law; and Legal and Judicial Ethics. For 2016 Bar exams, Presbitero J. Velasco confirmed that there may be 1 or 2 items involving enumeration and differentiation per exam. Update (May 3, 2017): Results, list of passers and top examinees are out today. According to sources, 3,747 out of 6,344 (59.06%) examinees passed. Update (April 7, 2017): Contrary to earlier reports that Bar Exam 2016 results will be out before Holy Week, a source through a report in Inquirer.net said that the Supreme Court has tentatively set a special en banc session on May 2, 2017 to discuss the overall passing rate and likewise release the results. The list of passers will be posted at Supreme Court official website and will be flashed via widescreen at Supreme Court's front yard. You may also refer to this page as we will also post the names of successful examinees. 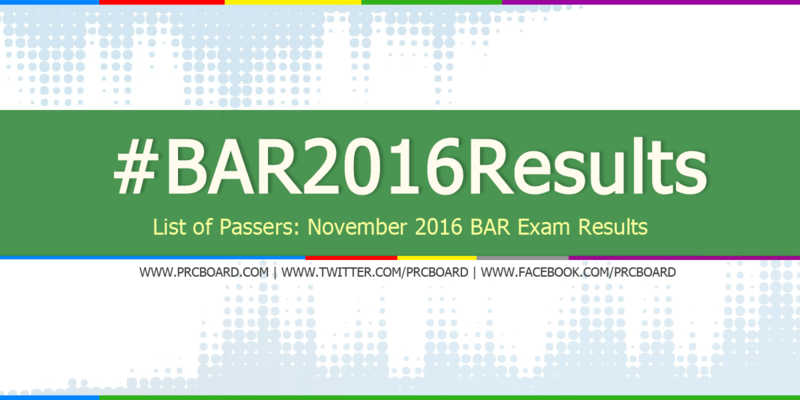 During November 2015 Bar exams, 1,731 out of the 6,605 examinees successfully passed or an overall passing rate of 26.21%. As per SC, a total of 7,193 filed for exams in which 18 were denied, 29 applicants withdrew their applications, leaving a total number of 7,146 who were admitted by the Supreme Court En Banc to take the examinations. At this number, 523 examinees did not show up on the first Sunday of the bar, leaving 6,623 after the first Sunday. After the fourth Sunday of the bar, only 6,605 examinees completed the examinations. On exams conducted in the year 2014, 1,126 out of 5,984 (18.82%) examinees passed while 1,174 out of 5,292 (22.18%) in 2013. Bar exams for the year 2015 (26.21%) has a higher overall passing rate as compared to the three succeeding years. Meanwhile, below is the summary of bar exam results in the last five (5) years. To receive up-to-date news about November 2016 Bar Exam results, we advise our visitors to bookmark this page, visit SC official website or follow us at our social media pages via Facebook and Twitter.